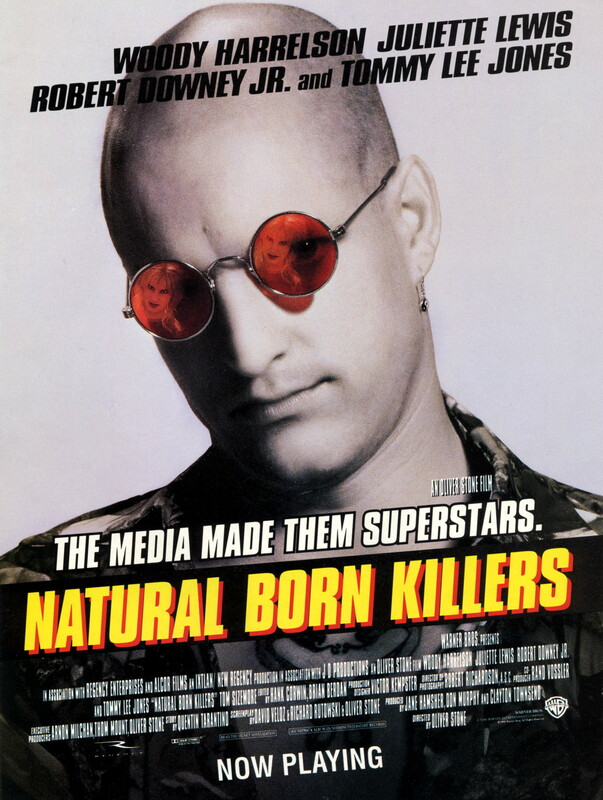 Natural Born Killers is a 1994 American satirical black comedy crime film directed by Oliver Stone and starring Woody Harrelson, Juliette Lewis, Robert Downey, Jr., Tom Sizemore, and Tommy Lee Jones. The film was released in the United States on August 26, 1994. The film tells the story of two victims of traumatic childhoods who became lovers and mass murderers, and are irresponsibly glorified by the mass media. The film is based on an original screenplay by Quentin Tarantino that was heavily revised by writer David Veloz, associate producer Richard Rutowski, and director Stone. Tarantino received story credit. Jane Hamsher, Don Murphy, and Clayton Townsend produced the film, with Arnon Milchan, Thom Mount, and Stone as executive producers. Notorious for its violent content and inspiring "copycat" crimes, the film was named the eighth most controversial film of all time by Entertainment Weekly in 2006.